This is the first of two posts on Baseball’s Unwritten Rules. The “unwritten rules” entail issues of masculinity and decorum. They’re often contradictory and at times fans, players, and former players in sports media disagree on what they really are. In this series we want to take a closer look at them and try to parse out the values and assumptions embedded within them. We argue that the very concept of ‘unwritten rules’ reveals coded language that highlight and expose the competing values in regards to race, class, masculinity, and fair play in American culture. Indeed, narratives surrounding the “unwritten rules” are a way to combine nostalgia, history, and sport into a type of cultural pedagogy. Major League Baseball’s best players will take the field tomorrow in Cincinnati for the annual All-Star Game. Several of those players will be members of the Kansas City Royals. The defending American League champions have been in the news a lot this season. Between accusations of stuffing the ballot box and electing four Royals as starters (out of seven total KC All-Stars) and their feisty start to the year, Kansas City’s season offers an interesting look inside baseball’s “unwritten rules.” Dating back to their improbable World Series run last fall, the narratives surrounding the Royals and their fans illustrates the complex and contradictory nature of expectations of how the game ought to be played. Last fall, Kansas City was the toast of baseball. The Royals were perennial losers that finally turned it around. After a 29-year playoff drought, they escaped elimination in a thrilling Wild Card game by inches. The victory gave them confidence, propelling the team to back to back sweeps of the heavily favored Los Angeles Angels of Anaheim and Baltimore Orioles en route to an American League Crown. The Royals became the first team in Major League Baseball history to start the postseason with eight straight wins. The Royals look more like your dad’s favorite team than the juiced-up mashers of the 1990s and 2000s. Kansas City hit the fewest home runs in Major League Baseball this season (95) but stole the most bases (153) in the league. Stealing bases and executing sacrifice bunts instead of bashing home runs was only half of it. Kansas City excelled because of its defensive prowess and lockdown bullpen. Throughout their playoff run, they made highlight reel catches look routine, and embarrassed star sluggers with a trio of “closers” protecting the 7th, 8th, and 9th innings. Defense and pitching not only mattered, they were what propelled them to victory. 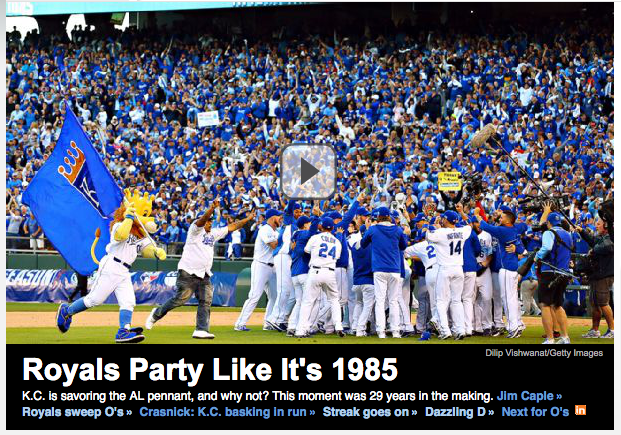 ESPN.com Front Page October 16, 2014. This was baseball. This was how the game should be played. Throughout the playoffs fans commented on how refreshing the Royals were. Their style of play was exciting and energetic. It reminded older fans of their youth, before steroids and the DH. Kansas City was a throwback team. They looked like a 1970s and ‘80s squad flying around the bases, running down fly balls, and manufacturing runs. Added to this nostalgia was the fact that the Royals had no real stars. Their payroll ranked in the bottom half of the league (19th of 30 teams). Instead, they were a youthful bunch finding their way together, playing team baseball. Every night a different player stepped up with a big hit or spectacular catch. Embedded in this view of the Royals, and of baseball in general, are subtle cues about how the game should be played. Central to these cues are notions of memory and nostalgia as well. The “refreshing” nature of the Royals’ emphasis on small ball, defense, and pitching denotes a judgment against home run hitters, steroids, and players that are presumed to be less athletic and skilled. Indeed, the narrative of the Royals playoff run reveals that team baseball requires stolen bases, spectacular catches, and sacrifice bunts, something that star players with big salaries don’t always buy into. While this certainly isn’t true, the narratives use nostalgia to present an ideal way of playing baseball. An innocent and right way that looks off into the past to create contrast with unpleasant events of the recent era. These representations of the right way to play baseball serve as a form of public pedagogy that reinforce specific cultural norms essential to the American way of life. Kansas City’s team represents the American underdog, who may have been down and forgotten, but after 29 years of hard work was finally back. The team and its fan embodied patience and loyalty. They stood for teamwork and selflessness, rejecting the greed of high salaries and individual fame. The Royals became America’s team last fall because they were entertaining but also because they embodied American values that many believed had been lost. Fast forward to the Spring of 2015. The Royals were still winning, proving 2014 was no fluke. They got off to a hot start. After winning their first seven games, they were baseball’s last undefeated team. The narratives of Kansas City’s baseball renaissance continued. Their pitching and defense remained impressive. They were showing that old school baseball still worked. And then, as April came to an end, the narrative changed. The Royals’ winning ways suddenly became unpopular. The swagger of a youthful Cinderella team faded. Opponents took offense to some of the team’s actions and sought to put them in their place. The Royals became targets. Literally. Through the first 16 games of the season, Kansas City players were hit by a total of 17 pitches. At first, the Royals dealt with this frustration by internalizing it. They continued about their way, winning games. Then, Brett Lawrie recklessly slid into second base, injuring Kansas City shortstop, Alcides Escobar. Depending on the replay angles, the slide looked a bit “dirty” with Lawrie’s spikes up. Escobar, luckily, only missed 2 games with his injury (but it could have been much worse). This event, teamed with the previous frustrations, led to a series of retaliations and near brawls. Royals starting pitcher, Yordano Ventura, hit Lawrie the next day, because that’s what the “unwritten rules” say. Ventura was ejected, but he’d already looked pretty miserable and was likely done for the day. Kansas City thought the skirmish was over. Oakland did not. They didn’t think Lawrie was reckless and felt slighted. On Sunday, during the first inning of the series finale, Scott Kazmir hit Lorenzo Cain. Perhaps it was a mistake, though Kazmir went on to have solid command of his pitches. His line for the day was 7.1 innings, 6 hits, 2 runs (both earned) 1 walk, and 5 strikeouts. After the beanball, both teams were warned. Kansas City Manager Ned Yost and Pitching Coach Dave Eiland did not like the warning. Given the issues over the past two days, they wanted Kazmir gone. After all, Ventura was ejected the night before with no warning. Yost and Eiland lost their argument, and spent the rest of the game in the clubhouse. The hit on Cain and the dual ejection of Yost and Eiland reignited tempers. Kelvin Herrera responded by throwing a pair of inside pitches at Lawrie. One of them hit him (in the upper shoulder, or according official MLB definitions, the “head area”). Herrera was promptly ejected. Royals bench coach Don Wakamatsu and the injured shortstop Escobar rushed to the field to argue and confront A’s players. They were thrown out too. If you’re keeping score at home, six Royals were ejected during the three game series compared with zero Athletics. Later that week, the Royals were fighting again. In a game against the Chicago White Sox on April 23rd tempers flared. The incident was sparked by a verbal exchange between Yordano Ventura and White Sox outfielder Adam Eaton in the seventh inning. Eaton hit a comebacker to the mound, Ventura fielded the ball, Eaton chipped a few words while he recorded the out. Ventura yelled back, and the dugouts cleared. The brawl resulted in multiple ejections and suspensions. Seven players were disciplined for their role in the fight. The confrontation was the culmination of several weeks of bad blood. Six players were hit in the season opening series between the two team in early April. Then, earlier in the game, Ventura hit Jose Abreau with a pitch. Ventura was at the center of both of these incidents as well as a third argument with the Angels’ Mike Trout earlier in the season. At only 24 years old, Royals Manager Ned Yost blamed it on Ventura’s youthfulness, and admitted the team needs to better control their emotions. The fights, however, signified more the emotional play. Fighting and hitting opposing batters is a part of baseball. It’s an integral part of the game’s “unwritten rules.” Pitchers are taught to protect their teammates. Players are also taught that if a fight erupts, everyone must join in. It is an intricate dance of hyper-masculinity that relies on conflicting ideas of sportsmanship and honor. A fan created t-shirt celebrating the Roylas’ “Bad Boy” image. As you might imagine, in the wake of these fights, Kansas City’s image took a hit. “The Kansas City Royals are transforming from the MLB‘s lovable underdogs to rabble rousing jerks. What’s the deal?” bloggers and talking heads wondered. In short order, the youthful swagger of the Royals’ playoff success transformed them from America’s sweethearts to a bunch of arrogant punks. Around the league they’d become known as “Bad Boys.” In their next series with the Minnesota Twins, pitcher Trevor Bauer wore boxing gloves in the dugout just in case the Royals caused any trouble. The pitcher’s role, it’s kind of like, you know, the sheriff in town. All you’re trying to do is send a message. You hurt one of our guys, we’re going to hurt one of your guys. And therein lies the problem. Baseball is full of cliches and platitudes. The “unwritten rules” can be difficult to parse. There are clearly notions of pride in terms of protection, but also conflicting ideas about classiness and sportsmanship. Players and teams need to have respect for the game and respect for their opponents. Yet, respect and pride can come into conflict. The Royals’ case is particularly interesting. In some ways, their pride and togetherness overshadowed their respect of their opponents and the game. They displayed too much emotion (a clear violation of the unwritten rules), and were perhaps too quick to retaliate. On the other hand, however, Kansas City’s fighting can be viewed as taking a stand and demanding respect. Through their actions they are declaring that they’re no longer losers and won’t be bullied. These opposing views are emblematic of the opaqueness of the “unwritten rules” themselves. The “unwritten rules” are a sort of player code. They represent a culture within the game tied to conceptions of masculinity dating back to the sport’s origins. Nineteenth-century baseball was a sport frequently played by clubs made up of urban workers. In the early game players and clubs policed themselves, but as Benjamin Rader explains, “baseball players tended to exploit every area within the game for which there was no explicit rule or no penalties level for violations.” Thus, the “unwritten rules” became a way of ensuring fair play and defending your team. The notions of fair play, respect, honor, and sportsmanship were not uniformly agreed upon, however. Clubs were organized across a variety of categories, including neighborhoods, occupations, companies, political parties, etc. Each group had a different value system. While the values changed and adapted as the sport became more professionalized, and Progressives with their Victorian values attempted to harness and tame the sport for their own goals, there remained latent tendencies that reflected the culture of nineteenth century industrial workers. At the heart of this difference was masculinity. Victorian Progressives wanted enthusiastic players who are selfless and work together. They needed to be humble and never showed off or demand praise. They don’t express emotions or interfere with others. This version of masculinity requires hard work, discipline, control, and measured responses. Sportsmanship and honor were tied to this stoic behavior. Working class players that grew up within the bachelor subculture of cities held a much different view. Masculinity was about physical toughness. Manliness involved aggressiveness in drinking, betting, and fighting. Teams protected their own through force and intimidation. Respect and honor was often earned through confrontation. Through the years these two competing notions of masculinity have become embedded in the game and its “unwritten rules.” The differences reflect competing world views and class backgrounds. Yet, today, middle class Progressive values often overrule working class attitudes in our definitions of sportsmanship and classiness. This is because so many of our cultural institutions were either built or legitimized by Progressive reformers. Sports were made palatable and acceptable to the public by Muscular Christians and Progressive reformers, who sought to root out as many of the working class ills as possible. In baseball, this is evidenced by the National League’s refusal to serve alcohol at games and play on Sunday in the late-nineteenth century. Owners sought to clean up the game and improve its social standing. Banning alcohol and gambling helped change the clientele, and cut down on fights both on and off the field. While the baseball establishment championed middle class values, it never entirely eliminated its working class roots. Many of the leading players came from urban and ethnic backgrounds, unfamiliar with Victorian values. Thus, the “unwritten rules” became contested ground and tied to one’s position and perspective. Today, these perspectives and positions sometimes overlap making it difficult to see that sportsmanship, classiness, and playing the game the right way are all value judgements embedded in our own personal history. Kansas City Royals Instagram, July 2, 2014. That is why the Royals are such an interesting example. They embody the contradictions within the “unwritten rules” of baseball. Their postseason success last fall underscores the right way to play the game based on a middle class, nostalgic view of the game. The “Bad Boy” image, on the hand, frightens the baseball establishment as a youthful team demands respect and eschews stoic celebration for cocky, emotional outbursts. Indeed, this same narrative continues into the All-Star game where the “unwritten rules” apply not only to players but also fans. 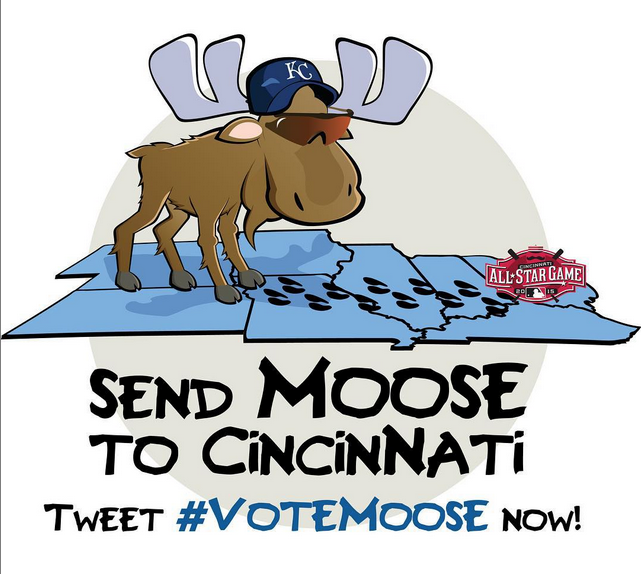 The Royals and their fans continue to ruffle the feathers of the baseball establishment by stuffing the ballot box. Many claim that you should only vote for players who truly deserve to be an All-Star. That All-Stars must be stars. They have to pass the “eye test.” They need to have impressive statistics. The sanctity of the game depends on respecting the All-Star honor. All good fans know that. But, good fans also support their team. Supporting your team, no matter what, makes you a loyal fan. Loyalty is important, and respected. After all, there’s nothing worse than a bandwagon fan. I found it interesting how you describe the Kansas City Royals change from their World Series run last year to becoming a more aggressive team this season. It seems like a big part of that reason was that these other teams were trying to test the Royals resolve more than anything else. They saw them as a threat and were attempting to bring them down. In retaliating, however, the Royals seemed to lose a bit of that charm that drove them through the World Series. But why did the Royals even have to retaliate? It does seem that a big part of it seems to be out of honor and in doing so they were saying that they would take being disrespected so easily. But I feel that they would be better off not retaliating and simply play a solid game of baseball. Have they kept up this level of aggressiveness? And if so how will it affect the playoffs? Hi Tony — thanks for you comment. The Royals have been pretty aggressive all season in terms on their play. They’ve cooled off a bit with their tempers. I can’t think of any major 2nd half issues. I think some of this comes with having earned respect early on and continuing to play well. They’ve also grown up quite a bit. As far as the play offs go, I think it depends on the match ups. Toronto is the only team in contention that has antagonized the Royals much this season. That could be a tense match up.